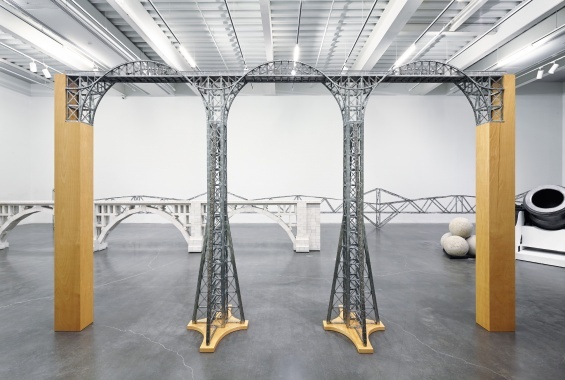 “Chris Burden: Extreme Measures” is an expansive presentation of Chris Burden’s work that is the artist’s first New York survey and first major exhibition in the US in over twenty-five years. Over the past decade, Burden has produced a number of elegant bridges built out of stainless steel parts based on children’s construction kits called Erector sets. Join New Museum educators in lively conversations about bridges and the art of Burden as you examine his Mexican Bridge (1998), Tyne Bridge Kit (2004), Three Arch Dry Stack Bridge, ¼ scale (2013), and Triple 21 Foot Truss Bridge (2013) and learn how to construct your own. Discover the limits of materials and the possibilities of architectural constructions as you design, construct, and test your own bridges in the New Museum Sky Room. New Museum First Saturdays for Families are free of charge. This program is designed and recommended for families with children aged between four and twelve years, and includes free New Museum admission for up to two adults per family. Children under eighteen are always admitted free. No preregistration is required. Space is limited and tickets are given out on a first come, first served basis. Your entire party must be present; tickets will not be given to partial parties. Major support is also provided by The Andy Warhol Foundation for the Visual Arts, Lonti Ebers and Bruce Flatt, Gagosian Gallery, Eugenio López, the National Endowment for the Arts, and Aby Rosen and Samantha Boardman. Generous support is provided by the Broad Art Foundation, Santa Monica, F.J. Sciame Construction Co., Inc., the Jacques and Natasha Gelman Foundation,LLWW Foundation, Catriona and Simon Mordant, Nicolas Berggruen Charitable Foundation, and Åke and Caisa Skeppner. The International Leadership Council of the New Museum is gratefully acknowledged. The publication for “Chris Burden: Extreme Measures” is made possible by the Stefan Edlis and Gael Neeson Foundation.